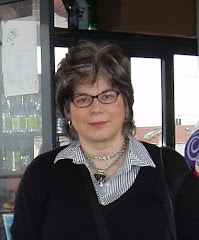 That means the cat is turning nine and Blog Appetit is closing in on its 135,000 page view. 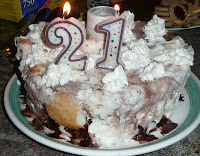 To celebrate, I'm posting my family's favorite homemade ice cream birthday cake. Thanks for stopping by and sharing these four years of words, images, recipes and opinions with me. This is more of a process and one that the kids can participate in as well. This recipe is adapted from one my mother-in-law, Joan Kramer, first made as a banana split cake. See the variation at the end. Each birthday child (or grown up) gets to pick their favorite flavors for the ice cream. Noah’s last cake was chocolate and coffee fudge. Seth usually sticks to cookie dough and cookies and creams. Gary likes Rocky Road and Vanilla. I like them all, but I’m especially fond of the ones with my homemade fruit sorbet, homemade angel food cake and homemade dark chocolate sauce. But usually we just use store bought ingredients. Just make sure your ice cream flavors are compatible or complimentary. I like to buy the ice cream in half gallon sizes so I know I'll have plenty to pack into the cake. Leftover cake, if you have any, freezes well and make a nice dessert or treat. You can use a tube pan if you don't have a spring form, but you will get the metal tube in the middle of your cake and the sides will not be as neat. Wrap a 9 to 10 inch spring form pan bottom and up the sides with aluminum foil. Scatter a handful or two of the cake chunks inside the pan. Alternate scoops of the two flavor ice creams around them. Drizzle the chocolate and caramel syrup in ribbons around the cake and ice cream. Press down with the back of the ice cream scoop until the cake and ice creams form a fairly level layer without air spaces. Repeat until you run out of ice cream and/or cake or reach within a ¼” of the top of the pan. Smooth out the top layer with the back of the scoop. (If desired you can write birthday messages in chocolate syrup on the top. Wrap well with plastic wrap and place in the freezer for at least two hours or preferably fours hours or overnight. (Can be made well ahead). Bring out about 20 minutes before serving. Just before serving remove foil and wrap, release the catch on the side of the spring form pan and remove cake (leaving the cake on the bottom section of the pan). Decorate with whipped cream, add candles, turn off the lights and sing “Happy Birthday.” Serve to admiring crowds, but don’t let them know how easy it all was. Banana Split Variation: Leave out the caramel syrup, scatter in small bits of banana and chopped nuts and chopped maraschino cherries (optional). Other Variations: Use any of your favorite sundaes for inspiration and add in pretty much any dessert topping or ice cream mix-in. From malt powder to marshmallow topping they’ll all work. Just be careful of items that could freeze hard enough to chip a tooth. I’d be careful with M&Ms, for example. About the photo, Seth's cake from last year had to be made in a tube pan because the spring form was missing in action. A spring form cake pan's sides come off much easier, making for a much neater cake.